Paul Hartley praised his Dundee side's blistering start to their thunderous win over Hamilton Academical, scoring four first-half goals. Hartley was delighted Dundee began at such a tempo given their recent propensity to start matches slowly. "I thought that we started the game brightly, we were sharp and on the front foot and the goals came at the right time," he told BBC Scotland. "The second half, we were hard to break down and a lot more solid today." Dundee bagged their four Dens Park goals in the opening 25 minutes, effectively killing the game as a contest as Kane Hemmings helped himself to a hat-trick. The hosts scored four times in a game for the first time since the opening day of the season to equal their best winning margin of the campaign. "Credit to all the players today, the guys coming on all made an impact and the fans gave us great backing," added Hartley. "We've had to suffer some criticism in recent weeks as we've not won a lot of games but hopefully that performance puts us back on track. "When we play we are a good team to watch, on our day as good as anybody with plenty of slick passing and we also showed another side in the second half that we can defend and see a game out." Dundee confirmed that midfielder Kevin Thomson was withdrawn with a hamstring injury and that further assessment will be required on Gary Irvine, who had to be stretchered off in the second half. 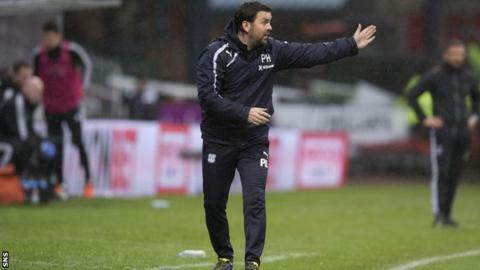 Hamilton manager Martin Canning was honest in his assessment of the way his team started. "If you defend the way we defended in the first 25 minutes then you'd struggle to beat a pub team," he said. "To win a game in the Premiership, then that defending is miles away. While our second half was better, you'd expect that." When asked if he could believe what he was seeing at the start of the game, Canning replied: "No, I couldn't. "The guys at the back have been excellent this season; Lucas [Tagliapietra] has been different class and he's done well in the games that he's played while Jamie [Sendles-White] is a young kid, 21, and hopefully it's a learning curve for him. But if you defend and concede sloppy goals like that you are going to struggle." Canning opted to substitute Sendles-White after the fourth Dundee goal. "I gave Jamie the opportunity to play himself back into the game," he said. "I didn't think he did it and I thought it was the right thing to do to take him off."